Rise and shine, Django Skyy Blue. Photo by Howard Lovering. Every dog owner has stumbled on this scene: a large, hairy beast luxuriously sprawled out, one perpendicular foot proclaiming the perfection of his blissed-out state. It’s a sight to make anyone smile, no matter how cross they might be. 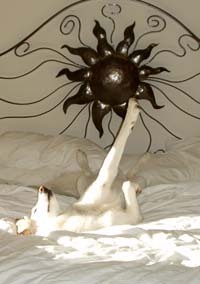 This photo of Django Skyy Blue basking in the morning Sun Valley sun on the bed of owner Howard Lovering instantly lit up the faces of every Expresso who saw it, making it the unanimous winner of the Idaho Mountain Express’ 2012 Valley Pets photo contest. The criterion for the photo contest was simple: We asked pet owners to show us how much their furry or feathered (or scaled) friend loves to live in the Wood River Valley. Each and every entry (more than 100 of them) captured a special moment for pet and owner, and we couldn’t bear to deprive them all of a moment in the spotlight. So, in the following pages are as many of our favorites as we could squeeze onto newsprint, placed into fun categories that reflect various elements of why pets (and people) love to live in the Wood River Valley. In addition, every perky puppy and happy horse put forward by his or her owner can be found on our online gallery at www.mtexpress.com/valleypets. And no, we’re are not being “speciest”—not a single kitty was submitted this year. Cat lovers, consider the gauntlet thrown for 2013. Murphy makes a new friend. Photo by Brienne Mabry.